Prior to developing the conversion of the S.M.L.E. to the silenced "Commando" carbine, De Lisle designed and built certainly one, and possibly a second, .22 inch rim-fire calibre moderated carbine for his own use. That carbine effectively became the prototype for the .45inch ACP (Auto Colt Pistol) calibre carbine, when, after a need for such a weapon had been realised at a high level in the clandestine services, Sir Malcolm Campbell heard of DeLisle's small-bore version, tested it, and initiated the design and build of a full-bore pistol-calibre version. Although these small-bore weapons undertook only the most basic of trials, it is doubtful whether one-such ever went into action, other than in the field of sport - putting dinner on De Lisle's own table. We are able to show images of DeLisle's own .22RF carbine, which arm was retained by him for many years prior to its being handed by a generous purchaser to the National Army Museum for safekeeping. Sadly, all that is now publicly available to researchers is this pair of photographs, by kind permission of the Museum's trustees. The whereabouts of the carbine are now uncertain. The carbine was hand built on the action of the ubiquitous Browning semi-automatic sporting rifle. A fairing-piece was added, below the forward part of the action, possibly structural or to support the rear of the fore-end and to protect the cocking-piece's modified and protruding operating flange in the ejection port. It is fastened to the front of the trigger-guard with one screw. 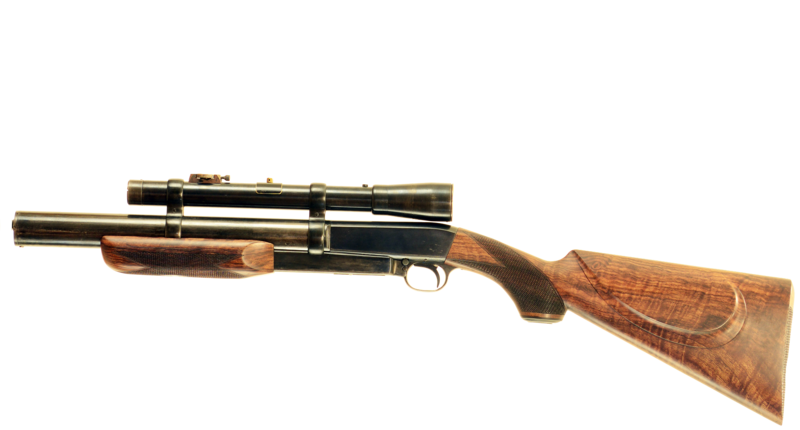 The rifle was especially stocked with high-quality walnut and the fore-end and pistol-grip finely chequered. A pair of figure-of-eight style split mounting brackets supported a telescope, akin to those from the Evans stable occasionally fitted to the Pattern '14 Enfield No.3T sniper rifles issued in the First World War. Many of these latter rifles and 'scopes again saw service in the 1939-45 War, but such telescopes as these had also been sold both commercially and as war surplus between the two major conflicts. We have, however, been able to produce never-before-seen images of one of these carbines. The telescope used by DeLisle was ironically a German "Fuess" model. We illustrate two outline and sectioned drawings associated with the specification for the SMLE based .45 calibre de Lisle carbine and its patent. 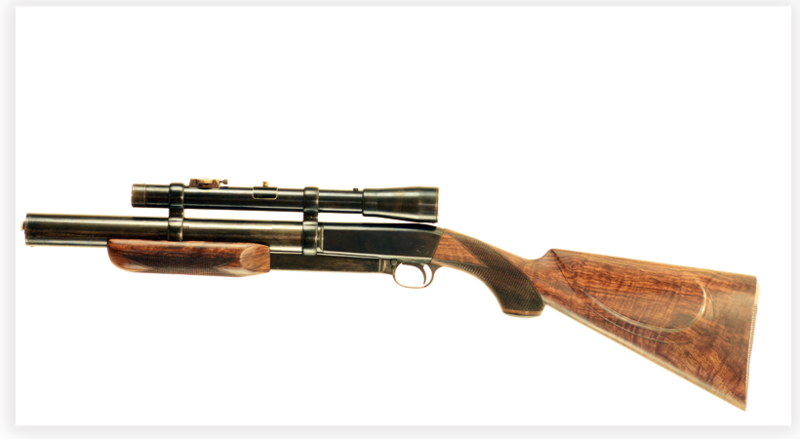 This design was drawn from that of the .22RF carbine that DeLisle himself built up, using the action from an FN Browning take-down .22RF semi-automatic sporting rifle of 'between the Wars' vintage. An apocryphal tale of one trial of the first DeLisle prototype is that the urgently required new weapon was completed overnight and taken to the London building of the Special Operations Executive (S.O.E.) first thing the following morning. Impatient to discover its capabilities, it was test-fired at pigeons on the roof of a building opposite. So quiet was the report, in the early part of the wartime "rush hour", that there was no reaction from passers-by. How the pigeons reacted was not reported; and neither is there any indication of concern for the fall of shot. Allegedly, the carbine was immediately despatched to the continent for further assessment (perhaps even a practical trial), and further examples ordered on the spot. One should perhaps remember that significant quantities of metal of all types were then falling from the skies over England, and the odd .45 calibre pistol round on a decaying trajectory, even had it been spotted, may barely have raised an eyebrow. Health and safety considerations were at the time hardly in the fore-front of general thinking.